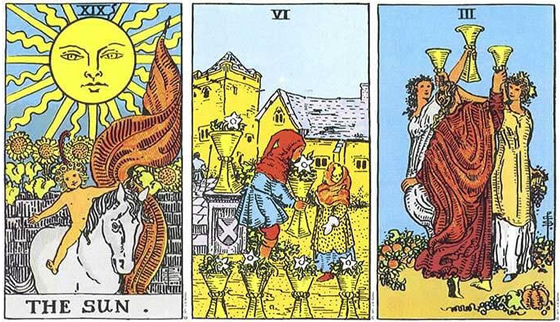 Here we have the Sun, the 6 of Cups and the 3 of Cups. How does this reading apply to your life? A light comes on when shedding light on people’s emotional drives. An awakening is needed. Focus on the positive in the world around you and your closest relationships. True, healthy bonds are necessary to make life feel lighter. Nostalgia for the good in your life will give you reason to celebrate. An aura of happiness makes life better. Appreciation of nature can bring a sense of fulfillment. Effort toward more abundance and fullness can bring progress. Start from a good place and watch the benefits grow. Your outlooks plays a huge role in your emotional state. For best results, do not have limited outlook or engage in gossip. Pay attention to what you bring to the whole and how your participation creates better for yourself and others. Don’t let the negativity of others drag you down, stay above it. A focus on divisions will only bring more negativity, so reverse it to bring out the best. Going along with negative gossip and the emotional opinions of others will only multiply negativity and dim your light. You can bring the light and create good relationships. Be with those that bring positivity into your life. Come back again to get new insights for your life from the tarot. Thank you for sharing with your friends online!